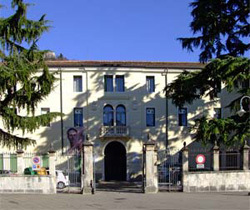 A twinning was established in October 1998 with Montecchio Maggiore, Vicenza, Italy. 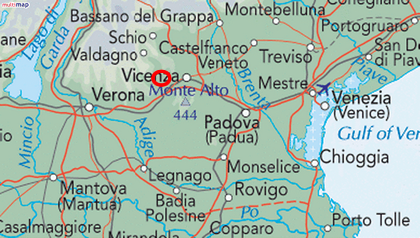 The town is 39km from Verona and 80km from Venice. Once predominately agricultural, the boom of the sixties switched the major part of its economy to industry and commerce. However, wine production is still a major factor and varieties well known in England are from this area; Valpolicella, Bardolino, Gambellara and Soave. There is a long history with archeological evidence of habitation since the Stone Age. 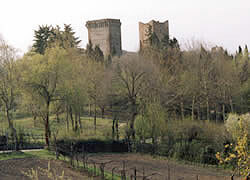 Two castle towers above the town are said to be the inspiration for a novel by Luigi da Porta in 1522, which reworked the legend of Romeo and Juliet, first found in Dante's " Divina Comedia" in 1306. Shakespeare based his plot on this novel, and Montague is thought to be his Anglicisation of Montecchio. Montecchio has more than 90 associations and clubs, which include cycling, weightlifting, tennis, karate, hockey, football, volleyball, photography, skating, boxing, philately, veterans, guides / scouts, alpine activities and other more academic pursuits such as theatre, art, and an Italian counterpart to the U3A. Close ties have been already established between Guides and Scouts from both communities and some schools have active partnerships. A summer school in English for children from the Anna Frank School is becoming a regular event. Amery Hill School hosted this in July 2009. A pattern of reciprocal visits of larger parties of visitors, accommodated by the host inhabitants, was established in 2000, and seems set to continue into the future on a year about basis.